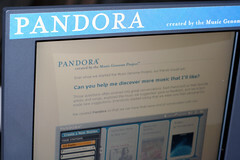 Apple’s own internet radio service may be launching in 2013 so how is Pandora reacting to it. Here are 3 convincing reasons why Pandora won’t be intimated or worried about any new internet services coming up. 1. Pandora is an all-important app made for iPhone, which means Pandora is among the main reasons people love iPhone. 2. Even Microsoft bows down to Pandora. Upon releasing Windows Phone 8 gave away one year free of Pandora One premium. 3. They are ahead of the competitors and would-be. They just released Pandora 4.0. 4. They’ve been to hell and back, since they started in 2005, they’ve faced the giants like Yahoo, AOL, and Microsoft, so anything new even from another giant like Apple, is a piece of cake for them. 5. Pandora is coming up with huge updates very soon. iHeart Radio, Apple Internet Radio, Xbox Music, and even the upcoming SiriusXM Personalized Radio, whatever comes their way, Pandora is determined to go up and won’t be affected any time soon by these competitors.